Cartridge 2600 ft/lb. Muzzle Energy - A Hunting Handgun For Any Game Animal Walking - Recoil Tamed with Effective Muzzle Compensator - Internal Lock - Ultimate Defensive Carry and Dangerous Game Backup Handgun - Easily Removeable Muzzle Compensator for Different Recoil Reduction Effects and to Accomodate Different Types of Ammunition - Comes with 2 Compensators; 1 for Lead Bullet and 1 for Jacketed Bullet Ammunition - Muzzle Energy Capability in Excess of 2000 ft/lb. in a 56 oz. 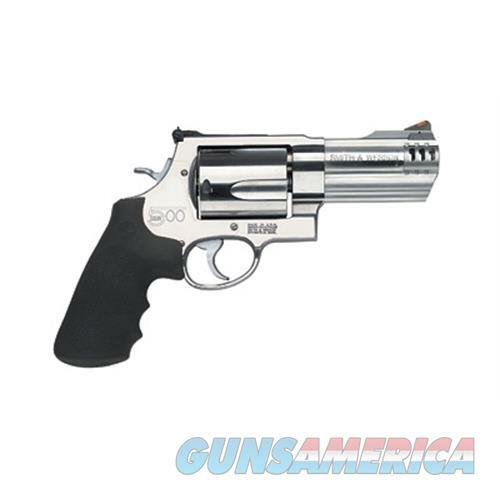 Package - In 2003 the gunsmiths and engineers at Smith & Wesson wanted to deliver maximum power for serious handgun hunters. The power they sought required an entirely new frame the massive X-Frame and was the basis for the new Model S&W500 the most powerful production revolver in the world. This ushered in the era of the big gun and was only the beginning. For ultimate power and velocity there's nothing even close to an X-Frame model handgun.